The 1.5" Basketweave Leather Belt is a performance-ready duty belt from 5.11 Tactical designed for plainclothes and undercover officers. 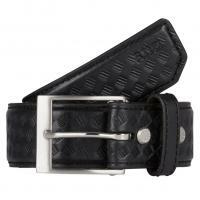 The belt is constructed from genuine, full-grain leather with a basketweave patterned finish. It includes the brand's innovative Permastiff® insert, which helps to maintain the belt's shape while increasing its load-bearing strength--ideal for use alongside a belt-mounted holster or other duty accessories. The nickel-plated buckle is a classic, rectangular single-pin design and features a unique "I-Beam" construction to improve durability. At the rear center, a hidden cuff key keeper provides discreet storage for spare handcuff keys. Very Heavy Duty, love it. I can attach Many items to it without sagging on my Hip. Should last a long time.